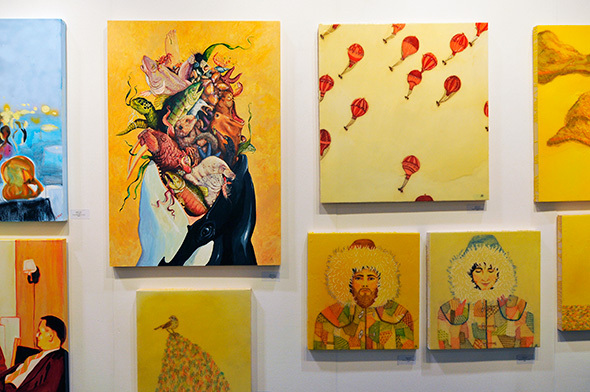 The Love Art Fair debuted in Toronto last night at the Direct Energy Centre, where it will run, tucked away in a bit of a corner, until Sunday, May 11. 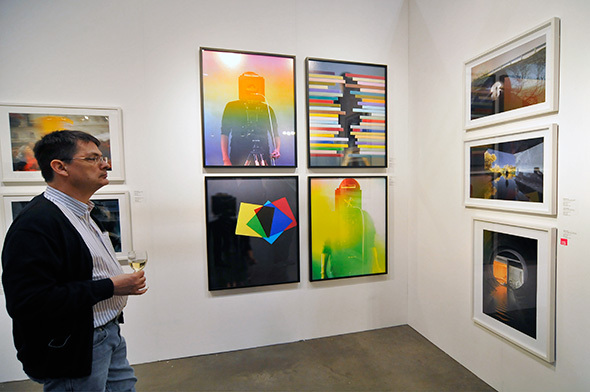 Launched in London in the 90s by Will Ramsay and known in other cities (Amsterdam, New York City, Milan, Mexico City, Seattle, Hong Kong, and more) as The Affordable Art Fair, the Love Art re-brand was necessary in Toronto due to AAF being a trademark of the tragically underwhelming Toronto Art Expo. The special name suits the vibe of the fair - to quote one gallerist who I'll leave unnamed (I might have been eavesdropping): "Art Toronto is dry, and this one is really fun." Love Art is similar to the Artist Project in its goals of showing and selling fine work under $10,000 (with many works selling for under $1,000 and tagged as such). 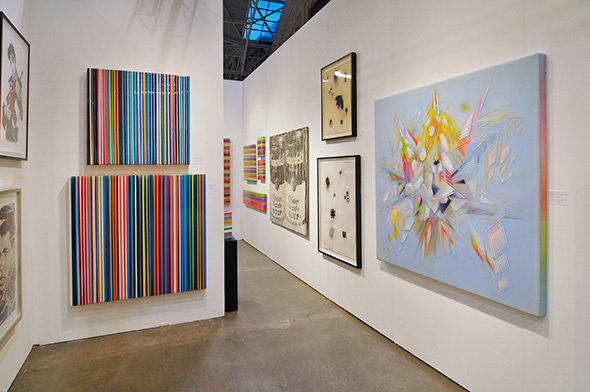 Unlike the Artist Project, however, galleries are representing artists instead of the artists themselves, meaning booths are curated and the show is much less a haphazard collection of hotel lobby paintings than a fun place to hang out with contemporary artwork. Galleries from Toronto including Bau-Xi, p|m, Parts, #Hashtag, and even old school gallery Roberts were on site beside galleries from LA, NYC, Beijing, Paris, Montreal, Uganda, and more. The appearance of online-only Toronto galleries Circuit Gallery and EYE BUY ART was notable - fairs like these are a rare chance for galleries without bricks and mortar locations to be visible IRL. On the other side of the spectrum, Manifold Editions had some Damien Hirst polka-dots on hand which got the fair buzzing, if mostly with audible eye rolls. Eccentric works in China Print Art Gallery (Beijing) were much more enchanting. 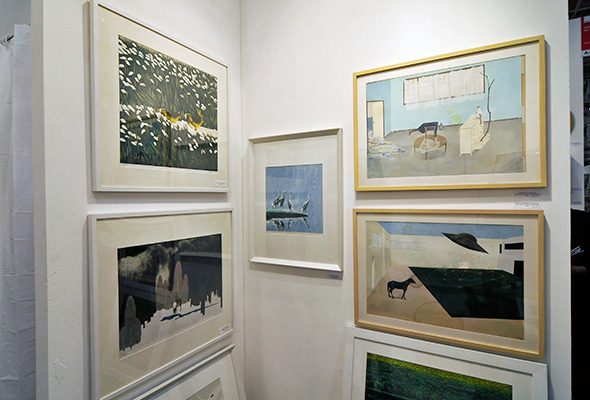 If I had the petty cash to take home anything from Love art it would have been Feng Ying's Afternoon, a watercolour of a woman leaning over a table in the company of her cat ($3,850), or (as I think most people at the fair would agree) Thou Shalt Die ($1,695) a cozy sweater from Nebraska gallery Darger HQ. There were also some $5,000 Marcel Dzama's on hand - the mark of a good art fair in my unbiased opinion. 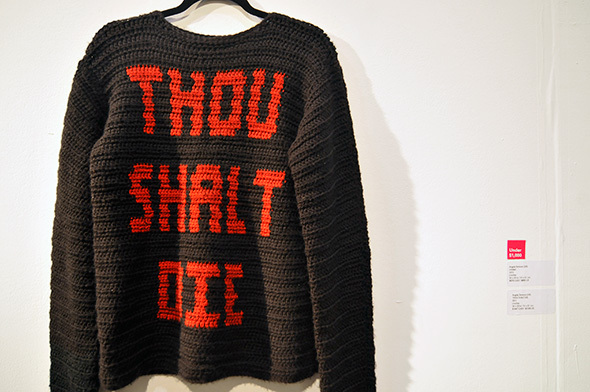 If you're not a fair of Hirst polka-dots, wearable sculpture with vaguely Satanic connotations, or contemporary illustration, the fair still more than enough to offer: while the photography selection was limited, there were paintings for landscape and cityscape lovers, contemporary abstract addicts (I will never understand you), and fans of portraiture, pop art, and sparkles - there are always sparkles at these things. The other mark of success was the apparent lack of bacon themed art, though Toronto's Jay Dart veered a little too close with his extreme beard obsession. Facial hair overdose aside, the Love Art Fair is a success. The one issue is the fair's set up: though considerable in size with over forty galleries in attendance, it still seems hidden away at Heritage Court in the back of huge Direct Energy Centre. 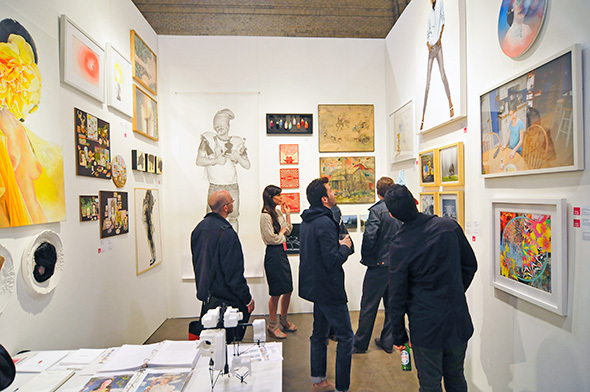 Still, once you're in the maze of booths, it's time well spent, especially if you've got at least a meagre budget to put toward your art collection. If not, there's always the eavesdropping. Love Art is open at Heritage Court, Direct Energy Centre (100 Princes' Blvd, Exhibition Place) Thursday, May 8 11am - 6pm, Friday, May 9 11am - 7pm (with free Friday hours from 5pm - 7pm only), Saturday, May 10 11am - 7pm, and Sunday, May 11 11am - 6pm. Regular admission is $12.